May 28 1933 is the anniversary of the date that Catherine Labouré was beatified by Pope Pius XI. FamVin invites us to spend a few moments today to listen as Fr. Carl Pieber, C.M. tells the story of the apparitions of Our Blessed Mother to St. Catherine Labouré. For more information visit the site of the Central Association of the Miraculous Medal. On this Memorial Day we remember in a special way all those who paid the ultimate price of war. We remember also those who lives were forever changed because of the loss of someone who was taken from them through the tragedy of war. With faith, we trust in the ultimate victory of the cross over death and sin. Fr. Tim Lyons, Assistant Superior of our Motherhouse, shares what PAR-Recycle Works is doing to get the message out about it program to address a key issue in helping people who have served their time re-enter society become productive citizens. Fr. Bob Maloney shares his homily for the closing of the 200th anniversary retreat May 26, 2017 at Marriotsville, Maryland. I suspect that women appreciate this gospel better than men do. Jesus says, “When a woman is in labor, she is in anguish because her hour has arrived; but when she has given birth to a child, she no longer remembers the pain because of her joy that a child has been born into the world.” A single mother whom I know once told me that the birth of her daughter was so painful that she would never have another child. Sixteen years later, having been abandoned by her husband, she told me that her daughter was the only source of joy that she had in the world. It is extremely important that we live our vocation with joy and that we encourage others to follow Christ joyfully too. Joy is contagious. When priests and brothers radiate it, people are drawn to them. Notice the striking image in Frost’s poem: “Only where love and need are one”, as “two eyes make one in sight.” As sharers in St. Vincent’s charism, this is crucial for us. Where need exists, we seek to bring practical love. Wherever we see need, we ask: “What’s to be done?” The answer in principle is simple: “When I was hungry, you gave me to eat. When I was naked, you clothed me. When I was homeless, you took me in.” But the answer in practice is much more complicated. With the limited resources that I have as an individual, or with the limited resources that we have as a group, what can we do to confront the most urgent needs here in the USA or in Panama or in Kenya with practical love? Today I encourage you always to be looking for the ways individually and communally to respond to urgent needs with both love and joy. Please, Mademoiselle, be quite joyful in willing everything that God wills. And because it is God’s good pleasure that we remain always in the holy joy of His love, let us remain in it and attach ourselves to it inseparably in this world, so that we may one day be merely one in Him, in whose love I am, Mademoiselle, your most humble and obedient servant. We rejoice in the Lord today. He has shared with us his own vocation to evangelize and serve the poor. It is a wonderful gift. So, as we leave this place of retreat, let our hearts be filled with gratitude and our lives be filled with joy. Please pray for the repose of the soul of Father Gerard Deitzer, C.M. Fr. Deitzer passed away peacefully at Chestnut Hill Hospital at 3:15pm. Funeral arrangements are to follow. We gather together today as people of faith and our faith is in the Resurrection of Jesus. It is in the midst of the Easter Season that we once again proclaim our faith. Our faith that our God lives and that not even death stopped him from living. ​The Gospels in these days present accounts that enable the Apostles and other believers to be affirmed in their belief by their encounters with the Risen Lord. ​There is no nostalgia in the story of the early Church, the Acts of the Apostles, no longing for Jesus because they had heard of the encounters that members of the community had with the living Resurrected Jesus. ​In our lives, we also have encounters with the risen Lord and those encounters occur in the Sacraments of the Church and when we encounter Christ in the goodness of others. ​Today we gather to bid Adieu to Brother Carmen. To God we send him. We do this as family, confreres, former students, and friends. Like most of us, I have known Carmen for many years. I lived with him at Princeton, St. John’s, St. Vincent’s Seminary and many, many weeks at Cape May. I can without a doubt say that Carmen was a clear sign of the Resurrection. Carmen’s words and actions made God’s love more real to others. ​Last night many of the confreres made references to Carmen’s vocation story. It is even posted on the bulletin board. Carmen was a young man when God called him from his home not too far from where we stand today to begin his life as a Vincentian Brother. During Carmen’s sickness, I often thought of Carmen’s calling. God must have really wanted him. At 16, he was faithful to the Monday Novena. He knew that God wanted him to be of service to him and he knew that it wasn’t priesthood. He would come at 16 to the Novena and through Mary’s intercession try to discern God’s will. While waiting to go upstairs to the Shrine he saw a brochure on becoming a Vincentian Brother. He always said that he received his vocation from the Blessed Mother. God must have really wanted Carmen to serve. ​And so he began his journey of service. He first worked in the kitchen here and at Ridgefield and then maintenance at Northampton, Albany and then he arrived at Princeton. There his life changed and he finished high school, went to college and received undergraduate and graduate degrees followed by years in the classroom, writing science workbooks, discovering computers while doing yearbook, running the Science and rocket clubs, becoming Director of Students. He knew that priesthood was not for him but he formed many a priest and even a Bishop. He finished his teaching at St. John’s University in the Chemistry Department. ​Carmen discovered and used his gifts well and in all those years in the science classroom. he helped his students understand the mystery of life. ​Carmen also manifested God’s graciousness. He made things nice for others. He had a good eye. Carmen loved Cape May and he made it a home. All were welcome and he couldn’t do enough for us. ​In these later years, he came back to where it all began. He returned to Mary and the Shrine and led the Novena Prayers. He was the editor of the Notebook and the Digest. He did Christ’s own work and visited the hospitals and the infirmary. ​Yes, the Risen Lord was made more present by Carmen, afaith filled, caring, generous Vincentian Confrere. 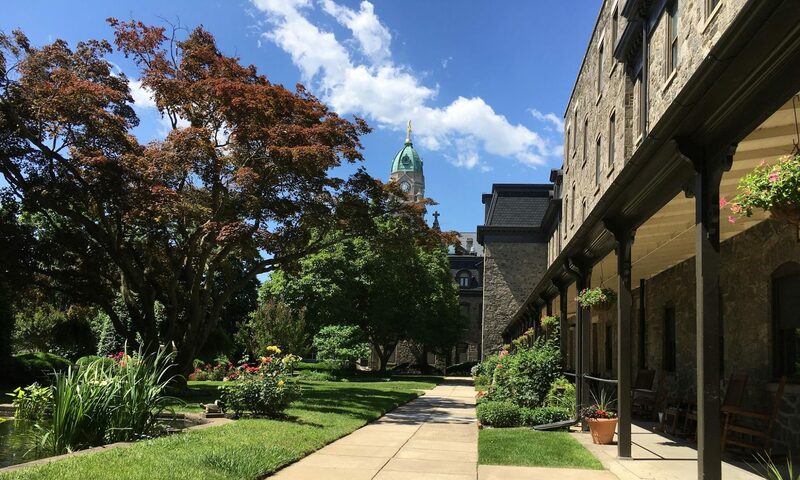 ​The same God who called him those many years ago to come and knock on the front door here at St. Vincent’s Seminary has called him again home to life with him. The door is open Carmen, no need to knock. ​Eternal Rest grant unto you. St. John’s University was blessed to have His Eminence Peter Kodwo Appiah Cardinal Turkson, Prefect of the Dicastery for Promoting Integral Human Development, as the distinguished speaker at the University’s Queens Campus undergraduate commencement ceremony on Sunday, May 21 at 10 a.m.
“We are humbled and honored that Cardinal Turkson has accepted our invitation to speak to our graduates at this year’s commencement ceremony,” Cardinal Turkson’s tireless work with the sick and homeless around the globe serves as a model for our students to love and respect all individuals and to serve those most in need. This dedication is at the core of who we are as a Vincentian university, and we are proud to have Cardinal Turkson share his message of social justice and caring for the marginalized with our newest alumni.” Conrado “Bobby” Gempesaw, Ph.D., President of St. John’s University. Cardinal Turkson of Ghana, known internationally as one of the most energetic leaders of the Church, was selected by Pope Francis to serve as Prefect of the recently established Dicastery on Promoting Integral Human Development. The new department, which took effect on January 1, 2017, takes on the tasks of the Pontifical Councils for Justice and Peace, Migrants and Itinerant Peoples, Healthcare Workers, and Cor Unum – the Papal charity that provides humanitarian assistance and encourages coordination of Catholic charitable works. The ceremony commemorates the 400th anniversary of this spiritual family. and Mr. Mark McGreevy, President of DePaul International. A reception hosted by Mr. Tajani will conclude the event. Public press releases from the international Vincentian Family can be found at its new Press Center: http://famvin.info. Please share them with your local, regional, and national press contacts. I BELIEVE in Jesus Christ, the Lord of life, who gave Himself for me, for you, for all without exception and who awaits me in the tabernacle; who is delivered as food under the species of bread and wine; who speaks to me in the desperate cry of the poor and the hungry and who presents himself in the suffering of the sick, the prisoner and the excluded. Prophets who heard the cry of a people and the call of God; Apostles who witnessed to the love and mercy of God: Paul of Tarsus, Francis of Assisi, John XXIII, John Paul II, Mother Teresa of Calcutta, Abbé Pierre and all who did not believe in vain. Louise de Marillac, who welcomed the love of God as a treasure of the Spirit and lived it in her loving commitment to the service of the poorest of the poor. I BELIEVE in the missionaries who, following the evangelizing Christ of the poor, gave their lives as an offering to the Father: Margarita Naseau, Rosalie Rendu, Francis-Régis Clet, Joan-Antide Thouret, Mary Magdalene Fontaine and fellow martyrs, Pier Giorgio Frassati, Justin de Jacobis, Ghebre Miguel, John Gabriel Perboyre, Frederic Ozanam, the martyrs of the revolution, Lindalva Justo de Oliveira, Catherine Laboure, Marta Wiecka and many others, who in their passion for Christ and humanity dreamed of a better world and who died in the struggle for justice and love. I BELIEVE in today’s missionaries: they are a sign of hope in a world of hopelessness; who are transformed by the spirit; who are creative in action and apostles in prayer; who are a reflection of the love and mercy of God to those whom the world despises; who embody the Word of God and live it in response to their baptism. All of them inspired by the Holy Spirit are living testimony of the work of Saint Vincent de Paul and Louise de Marillac. I BELIEVE in the Lord of history – – of yesterday and today and tomorrow. Original source: Corazón de Paúl website.